When I was researching recipes for Mardi Gras there was one thing that was a constant on every menu and every list that I found – beignets. Quite simply, a beignet is a pastry made from deep-fried dough, much like a doughnut, and then dusted with a liberal coating of powdered sugar. 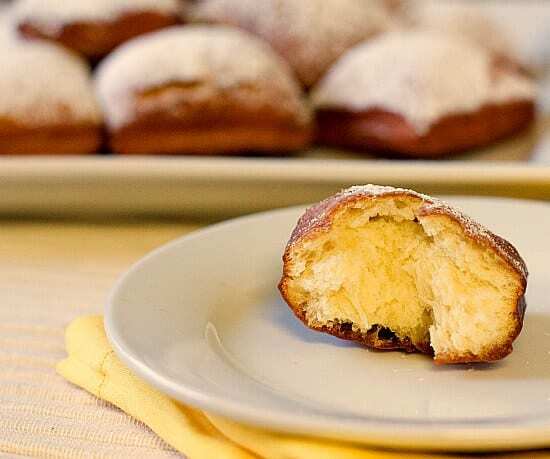 Beignets are actually the official state doughnut of Louisiana, which would explain their deep affiliation with New Orleans and the tie they have with Mardi Gras celebrations. I have never been to New Orleans but my mom was there once, and she came home raving about beignets, so much so that she bought a beignets mix upon her return so she could make them at home. This was a long time ago, so I’m not sure what happened, but those suckers did not turn out. I was thrilled at the idea of giving them another go, from scratch this time, especially since I had such great success with doughnuts last summer. 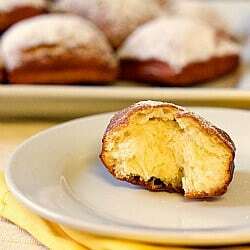 The dough for beignets is a sweetened yeast dough, made with bread flour, which gives the pastries a sturdy exterior – they hold their shape extremely well. The dough is mixed together (it takes less than 15 minutes!) and then chilled in the refrigerator for at least 4 hours, or up to an entire day. 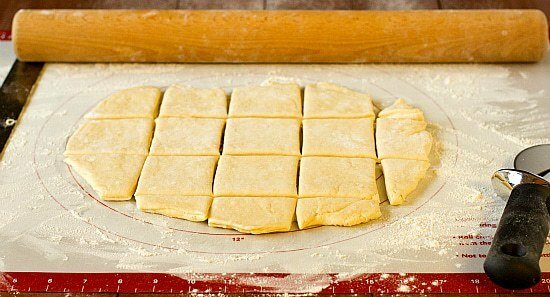 When you’re ready to make your beignets you simply roll out the dough and cut it into 2-inch squares, then drop them into your frying vessel. They only take a couple of minutes on each side to turn a beautiful golden brown and to magically puff in the middle, creating rotund little pastries. Once out of the oil and drained, they get a generous dusting of powdered sugar and are ready to eat. These are absolutely delicious – a little like a doughnut, but a tad bit different. They are fluffy, sweet, and of course… fried. Yum. I’m excited to have another regional specialty under my belt, I love exploring the food world! Combine the yeast, ½ cup warm water, and 1 teaspoon granulated sugar in the bowl of a heavy-duty stand mixer; let stand 5 minutes. Add milk, eggs, salt, and remaining granulated sugar. Microwave remaining 1 cup water until hot (about 115°); stir in shortening until melted. Add to yeast mixture. Using the paddle attachment, beat at low speed, gradually adding 4 cups flour, until smooth. Switch to a dough hook and gradually add remaining 2½ to 3 cups flour, beating until a sticky dough forms. Transfer to a lightly greased bowl; turn to grease top. Cover and chill 4 to 24 hours. When you're ready to fry the beignets, turn the dough out onto a floured surface; roll to ¼-inch thickness. Cut into 2½-inch squares. Pour oil to depth of 2 to 3 inches into a Dutch oven; heat to 360°. Fry dough, in batches, 2 to 3 minutes on each side or until golden brown. Drain on a wire rack. Dust immediately with powdered sugar. 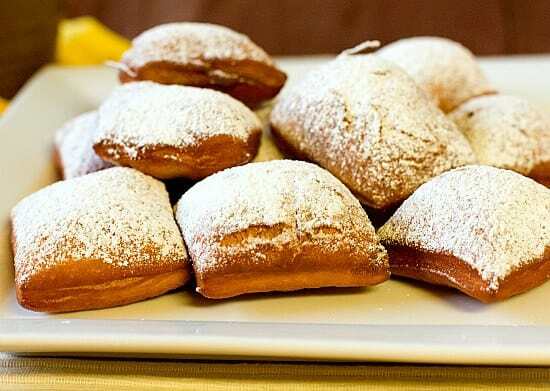 Very sorry, but there is nothing about these, other than the powdered sugar, that resembles a beignet. I grew up in New. Orleans and have eaten 100’s of them. 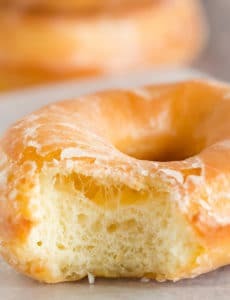 Yours look like cake doughnuts – they’re dense. A beignet is light and airy, almost hollow. I’m sure yours probably taste good, but they are not beignets. 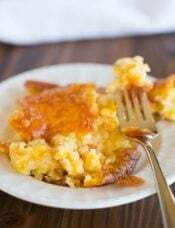 I too grew up in Louisiana and these are my all time favorite recipe. They are absolutely light and airy and perfectly doughy too. Mais, we gon have to disagree, Scott. These turned out perfect! I followed the recipe exactly and could not be happier! I did put the cooked beignets in a paper bag and shook them around in powdered sugar (and some in cinnamon sugar!) for less mess. Another great recipe. Love your site! Thanks so much! When was teaching a co-worker would make these for us every Shrove Tuesday. He had a cherry in the middle, supposedly some kind of tradition for that day. They were awesome. Thanks for the memory! Hi, I wanted to make these but only have instant yeast. what quantity do I use? You would use the same quantity. Oh Mylanta! I have made these twice! and L-O-V-E them. Honestly I have to say you really do make me look like I am some super star with all your recipes! So I made these for work and as a result you have at least 5 new followers. I agree with melissa b :). I’m from the New Orleans area and beignets are usually much more airy/fluffy. When I was little my mom would cut up biscuit dough and fry it to make homemade beignets (the store-bought mix is so gross). The texture was somewhat similar. I know most tourists hit up Cafe du Monde, whose beignets are really airy, but I prefer Morning Call…their beignets are a little more dense. And their coffee is sooo good. These do not look anything like beignets, they don’t have the right consistency. Beignets puff up when fried in oil, so they should not be dense in the middle but should be almost empty. On a different note, I made the Irish Car Bomb cupcakes and made a batch slightly altered to become B52(my fave shot) cupcakes. I, of course had to quadruple the liquors in the ganache and frosting(NOLA girl needs to taste her liquor). They were such a hit. T.Y. these are the first beignets i’ve ever had (i just made them last night), and they are amazing! i’m used to heavily fatty funnel cake from the state fair, so fried doughs usually turn me off a little, but these were perfect. i have a question, though. the dough is really sticky, and i ended up having to use a lot of flour so i could roll it out and cut it. is there any easier way to roll it out without using an excess of flour or losing too much of the dough? or should they have a lot of flour? i made half a batch and used 3 1/4 c flour (so, the lower amount that you give in your recipe), and had to add probably an extra 1/4-1/2 c until the dough didn’t stick to the rolling pin anymore. Hi Nick, What you did is actually pretty right on. If you used a half recipe then the flour amount would be 3 1/4 to 3 1/2 cups, so I think you were good with just needing an extra few tablespoons for rolling out. I always generously flour the area I’m going to use to roll, flour the dough, and flour the rolling pin. 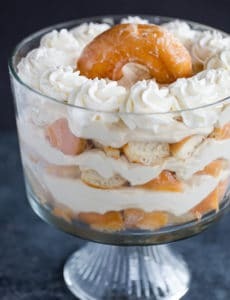 I really want to make these! They look absolutely delicious. Anything that even remotely resembles fried dough to me is on my to bake list! Oh how I wish I had some of these beignets today! They look amazing and so fluffy! Before I retired, a fellow teacher and his wife would make these for us every Shrove Tuesday. There was always a cherry in the center, though, apparently some custom for pre-Lent. Have you ever heard of that? Ooh no I haven’t heard of the cherry in the middle. I did some reading up on the background of beignets, but didn’t come across that. Sounds fun, though! Now that I think of it, it could be a Polish thing that is very similar to this. OMG Beignets???? I made them once. I made the dough in my bread machine, rolled out the dough, cut them out and fried them. They were TDF. These look so good. Light pillows of sweet airy dough. I had the pleasure of waltzing around New Orleans once with that white paper sack packed with powdered sugar and doughy nuggets. Yours look divine and I will dream of laying my head down on one of them with the powdered sugar dust exploding all over as my head hits the delicious pillow…. These look great! 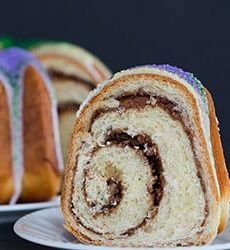 I wish I would have had the recipe over the weekend so I could have made them…Next year :) Happy Mardi Gras! Bread flour has more protein in it than regular all-purpose flour. I think it’s supposed to make a firmer dough. AP flour can usually be substituted for bread flour but results may not be quite as good. Bread flour is widely available (in the U.S. anyway), just look in the baking aisle of your grocery store, it should be next to AP flour. Girl, you are dangerous. They have something like this at The Olive Garden. You dip them in chocolate sauce. Yes, after they’ve been coated in sugar. It’s worth only eating an appetizer for a meal, in order to eat these for dessert. Bread flour has more protein/gluten than regular all-purpose flour; it makes for a sturdier dough in some baked goods. It’s actually not hard to find at all – you can find it in any supermarket next to the all-purpose flours. As far as substituting, all-purpose flour can be used, but there will be some texture differences in the final product. Thank you for the recipe. I too, would like to know if there’s a way these can be baked instead of fried. Your help is appreciated. I have been wanting to try beignets for awhile now, ever since my daughter fell in love with The Princess and the Frog. Yours, just look fantastic. I guess it is time to make them! Would you just look at those little pillows of deliciousness? It seems like anytime one of my friends takes a trip to New Orleans, a photo of them appears somewhere of them eating beignets. Funny thing is I have never had one! I dunno if I want to wait until I take a trip to N.O or just make them myself!